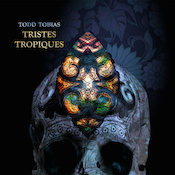 Let’s have Mr. Tobias introduce his album, Tristes Tropiques: “A dreamy, hypnotic, melancholy-soaked collection evoking far-flung places where small-scale societies and indigenous cultures have vanished or are in the process of being swallowed by an ever-expanding global civilization.” Cheery, huh? What I hear is a collection of off-kilter, inventive, somewhat post-rock musings. I say somewhat because while the standard song structure pops through in places, it’s most often warped a bit or coated in curling ambient sounds. It comes out like a soundtrack for wandering through a hazy fog late at night, head down and a little sad. The melancholy factor here is quite high, but beautifully handled, darts of emotion that pack solid punch. The post-rock side of the equation is not as present at the start of the album; it slides in later. “Malayakolam (Rising Sun)” falls more into a drone space. A manipulated chant repeats hypnotically over a building wall of pads and guitar. Tobias bookends the album with this idea—the closer is called “Malayakolam (Setting Sun).” But as soon as the second track kicks in, we’re in a more rhythmic space. “Piraha” has a certain edge-of-tribal cool to its percussion, but offsets it with warbling guitar. Or at least, I think that’s a guitar. Whatever it is, the sound hooks straight into me. From there, most tracks cleave to a post-rock kind of line that’s underscored with the foggy, sad sounds of drone and, throughout, an air of the familiarly exotic. “Xingu” is a piano soundtrack to a walk in the rain, a simple ballad made deeper through atmosphere. “Hiva Oa” pairs slow-picked acoustic guitar and ambient drones that occasionally threaten to rise up in dissonance, but inevitably behave. It creates an interesting “where are we going?” vibe to the piece. “Gharapuri” jettisons us into the album’s darkest space. Here, we’re back with manipulated chant, but it feels more aggressive. The drones underneath have a scary-movie edge to them, a real sense of tension. The fact that it’s followed by the bright, clean acoustic tones of “Nan Madol” shows Tobias’ sense of balance, which is on display throughout. That’s one thing that impressed me about Tristes Tropiques; it’s well balanced between dark and light, heavy and quiet. Also, the longest track here is under six minutes long, yet every track lands with exquisite force. Tobias loads a more-than-amplke supply of emotion into his work. Tristes Tropiques is a vivid, fully realized album that rewards the up-close listen. It’s only 44 minutes long, but the time spent inside it stretches out nicely. Expect many repeat listens for this one. A captivating release from Todd Tobias.